Joe has significant experience in the policy arena at both the state and national levels. In 2007, he worked with other members of NNSTOY to draft language and secure sponsorship for the Teacher at the Table Act. He was a founding board member of an educational advocacy group called Advance Illinois. He served on the organization’s executive committee. Working together with Chief of Staff Bill Daley, Speaker of the House Dennis Hastert, Governor Jim Edgar and other top policy makers and business leaders the organization has become an agent for positive change in the area of educational reform. While at Advance Illinois Joe helped pass legislation that resulted in changes on the state report card, teacher evaluation system, career and technical education, and the colleges of education. He has testified numerous times before the House and Senate Education Committees. He also helped secure major funding from the Joyce Foundation to create an Educator Advisory Board comprised of some of the top educators in the state. Joe Fatheree, the 2007 Illinois Teacher of the Year, has been teaching Technology and History at Effingham High School since 1990. 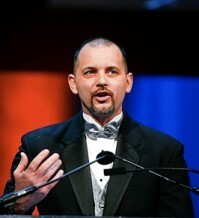 He was the recipient of the NEA’s National Award for Teaching Excellence in 2009, and was awarded the Leaders in Learning Award by the Cable Industry in 2009. He has also been recognized for his work in television with three Mid America Emmy Awards for producing and writing.